When you talk about chicken, what is the first thing that comes to your mind? Most of us would probably answer “fried chicken” because why not, right? Besides, who could resist such delightful taste combined with crispy skin on the outside and tender chicken meat on the inside? But fried chicken isn’t the only delicious meal worth savouring for. Because we will explore 10 popular chicken dishes from around the world. This popular Hungarian chicken dish is also known as paprikás csirke made from paprika, peppers and onion. And did you know chicken paprikash has an illustrious history going way back in the mid-19th century? Chicken Milanesa is a type of schnitzel coated with beaten eggs and breadcrumbs. Common spices including parsley, salt and pepper are added prior to deep-frying in a skillet over medium-high heat. Served with lemon and fries. Jerk is a popular style of cooking in Jamaica where the chicken is seasoned with pimento and other spices. The chicken is traditionally grilled over pimento wood. Served with hot Scotch bonnet sauce on the side. Doro Wat is literally known as chicken stew and happens to be a national dish in Ethiopia. The chicken is traditionally spicy made with berbere powder (a spice mixture of chilli peppers, paprika and fenugreek) and nit’ir qibe (Ethiopian spiced butter). Served with an Ethiopian flatbread known as injera. A chicken dish is typically served as a main course. But tavuk gogsu is a different case altogether. Believe it or not, it is actually a Turkish dessert made with milk pudding and… shredded chicken breast! The chicken-based dessert is best described as “sweet, rich and robust with a rice pudding-like taste”. This well-known poultry dish is basically a Peruvian version of roast chicken marinated in soy sauce with paprika, cumin and garlic before roasted on a rotisserie. Served with aji de huacatay, a spicy green sauce made from Aji Amarillo paste (yellow chilli pepper) and huacatay paste (Peruvian black mint). Gyros is a Greek version of chicken kebab made from a slab of chicken meat (or other meats like beef and lamb) hanging vertically from a spit. 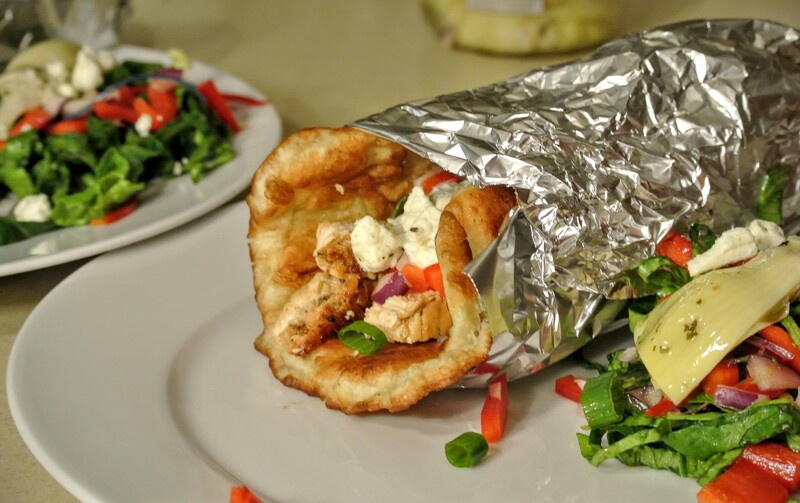 The meat is placed in a pita bread and topped with chopped tomatoes, onions and tzatziki sauce. Xiang Ji Pai is a popular street food in Taiwan breaded with five spice powder (Chinese cinnamon, Sichuan pepper, star anise, fennel seeds and mandarin orange peel). The chicken is coated with sweet potato starch before deep-frying until golden crisp. Adobo is a popular sauce-based chicken marinated in vinegar, soy sauce and garlic for few hours. The chicken is brought to a boil over high heat before simmered for over 30-40 minutes until fork tender. Served with rice. Larb is widely considered as the national dish in Laos made with minced chicken (or other meats like beef, duck or pork). The minced meat is tossed with fish sauce and lime juice. Larb can be consumed as an appetiser or served with rice.